We do all sampling for you for your first order. We send you samples for your approval. Sampling time Minimum 15 to 20 days. You need to provide us the sampling charges. If you have a account with Shipping Agent (DHL, Fedex, TNT, Aramex) you provide us the same or we send you through our shipping agent. We can use low cost courier company and let you know the cost of shipping. 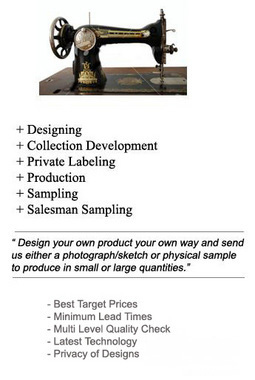 If you require pre-production and salesmen sample we can provide you the same. Production Time : Take between 60 to 90 Days for production after approval of all samples, colours, fabric quality etc. We regularly update you regarding production. Delivery of Packed Shipment : Either through your Agent or Through our Agent in India. We recommend you to use our agent for shipping purposes. We will provide you the cost.